Hero announced its planned updates to their flagship motorcycles, the Karizma and its faired sibling, the ZMR just before Diwali last year. The company hadn't revealed a launch time line and though we still haven't officially received a test bike yet, Hero dealers all over Maharashtra are now displaying and taking books for the new machines. We took a ZMR out for a really short spin for a quick first ride review. The new fairing looks quite big with twin lamps, placed on top of each other. This isn't a very conventional approach to motorcycle design but it is quite the way Erik Buell likes his machines to be. In fact, the EBR1190 also has a similar design baseline. Flanking the vertical headlamps are clear lens turn indicators which come with LED strips above them. The mirror stalks are mounted on top of the fairing, just like on the outgoing ZMR bike. The lower part of the bodywork though has been revised and gets new panels and graphics. 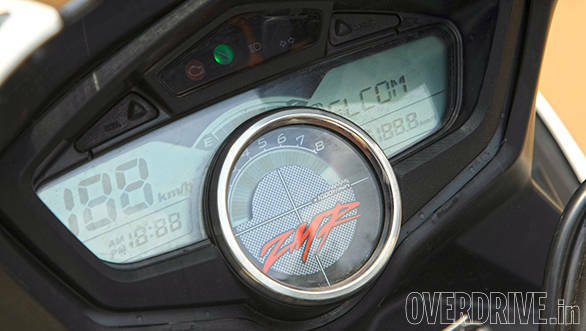 The new ZMR gets an instrument panel with the old digital all console which shows the rev counter and other tell tale lights. The side stand indicator warning is a new feature. Hero has tuned the engine for better performance. The 223cc oil-cooled, fuel injected four-stroke single now makes 20PS of power (up by 2.2PS) and 19.7Nm of torque (up by 1.4Nm). Peak torque is now accessible at a lower 6500rpm while peak power is now produced 1000rpm higher, at 8000rpm. Increase in the power and torque can be attributed partly to an increased compression ratio- 9:1 to 9.6:1. Hero hasn't altered the gearing though. This enables the ZMR to be an even more effortless motorcycle to ride than before.The transmission is still a five-speed unit. Hero claims a 0-60kmph sprint of 3.6 seconds while the top speed is 129kmph. On the move, the 157kg motorcycle feels brisk. Revisions to the fairing send more air flow to the engine, which in turn cools it better. 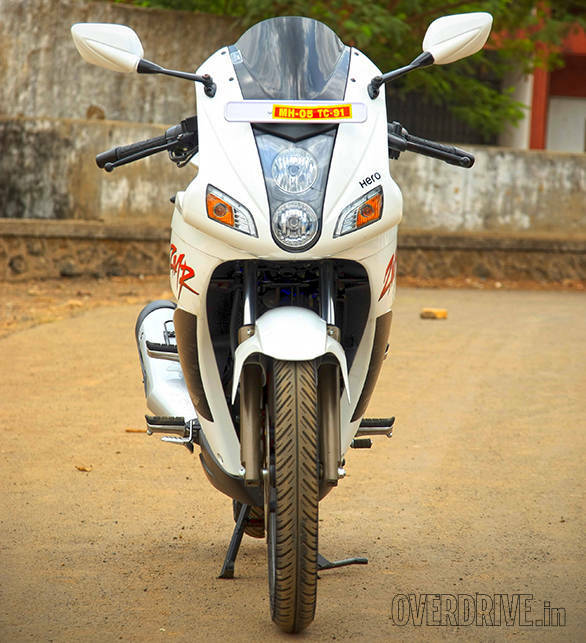 The Pulsar 200NS in the meanwhile makes 23.5PS of power from its 200cc engine. Our ride was really short but you can immediately tell that the Hero has preserved that amazing ride quality that was a standout feature of the Karizma from the start. Though the seat height has gone up by 14mm and there are new lower set clip-ons on offer, the comfortably positioned foot pegs keep the riding position friendly. The chassis is still the same with only the wheelbase going up by 10mm. The bike we rode was brand new so we will not comment on the brakes. But just like its predecessor, it has 276mm front and 240mm rear disc brakes. 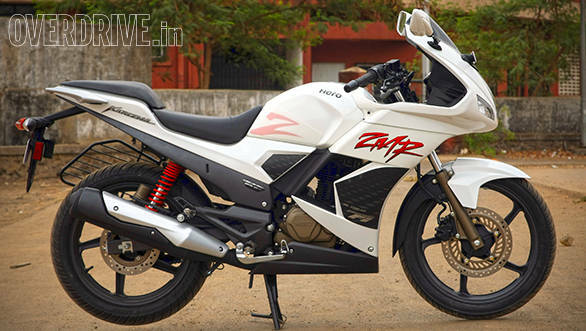 Hero has given the new ZMR fatter rubber as well (80 / 100 x 18 for the front and 120 / 80 x 18 for the rear). 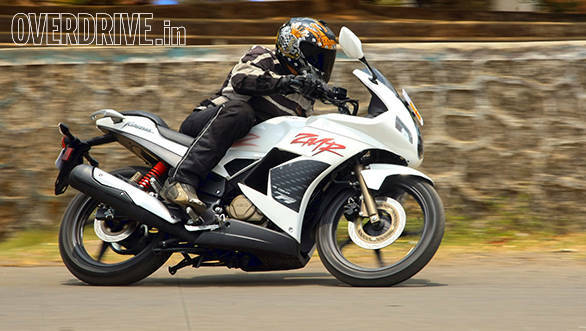 The Karizma has always been a stable, unhurried handler and the ZMR felt only slightly more sure footed than before. But again, it isn't fair to draw handling conclusions over such a short ride. 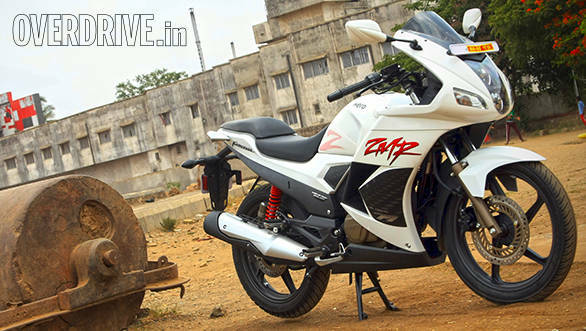 The new 2014 Hero Karizma ZMR is on sale now at Rs 1.07 lakh ex-showroom Mumbai. Rs 21,000 below this is it's naked cousin, the Karizma. Hero dealers tell us that sales are on across India and there currently is no waiting period for the bike. As we have said repeatedly, we rode a dealer test bike for a short 20 minutes only. This means our impressions here should be treated as rough guidelines unlike our usual, comprehensive first rides. We are expecting the official test bike to arrive soon and we will have our comprehensive and exactingly detailed story then. Stay tuned.